Greentrax has released another fine CD of Scots language song. 'Jeelie Jars n Coalie Backies' is the latest release from the Prestonpans folk singer Alex Hodgson. 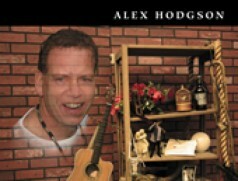 Twice a finalist in the 'Burnsong' song writing competition, Hodgson has been writing and performing for many years. This excellent CD shows Scots songwriting is a continuing and vibrant tradition. Tam Lin - a song for Halloween.